The patient is a firefighter/paramedic who was diagnosed with pellucid marginal degeneration OU. The patient had corneal crosslinking on both eyes and presented needing an improvement to vision for work. Patient is also in a band and had high visual demands for night driving and dim environments. The patient is happy with the acuity and ability to wear contacts. He feels his vision has improved with the contact lenses. The original lens OD, UltraHealth, at follow-up was minimally tight fitting and inferiorly decentered. Patient stated clarity was great but glare/halo was annoying. An UltraHealth FC was ordered. At follow-up the patient was happy OD and wanted to try UltraHealth FC (UH-FC) on his left eye (he was already wearing UltraHealth (UH). I advised the patient he was doing well and not to change OS. He persisted and an UltraHealth-FC was tried OS. 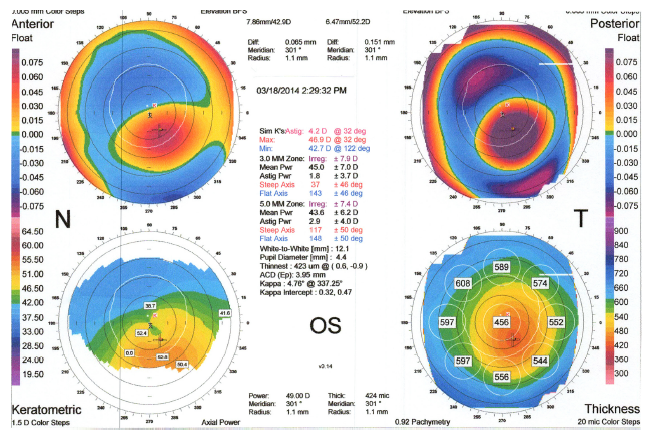 Patient wanted to compare glare/halo between the two lenses. When the UH-FC lens came in the patient preferred the standard UH, although acuity was equal. At this visit the patient preferred a combo of the UH-FC OD and original UH OS because the shadowing was minimized. The patient was happy. The patient wears the lenses 12-14 hours a day. He states he is happy overall, but still has some halos/glare at night. Patient was wearing glasses before, and is extremely happy to be in contact lenses that work for most activities. This fit was more challenging due to the expectations/needs of the patient. The patient has pellucid degeneration and the lens would decenter slightly inferiorly which resulted in a small amount of residual glare/halo. We were able to minimize the glare/halo with the UltraHealth FC. 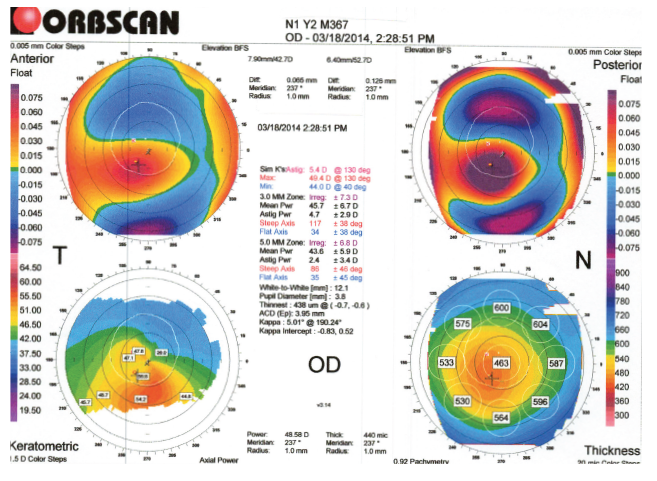 Overall the patient was happy and noted improved quality of vision.